TONTINE: Participatory electronic tontine, How it works here? Participatory Electronic tontine Flash Box and Flash packs, what is it? 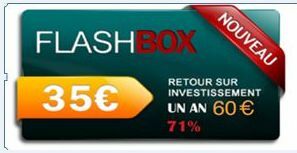 The Participatory Electronic Tontines, Flash Box and Flash Packs are investment products from Maximum PubliCash. Their operation scheme mimics the African classical tontine mechanism, namely, the order and number of shareholdings and amplifies it through electronic means to bring it to world scale and reach a large mass. The system works on the principle of flow (inflow - outflow) . When you buy Flash Box or Flash Packs, the money you invest goes to pay back the investment of others who have preceded you in the same category of product. The time to the return of your investment, or the duration of the rotation for your turn to receive money arrives, is not precisely determined, but it is shorter than in a conventional tontine. To answer the common question of "when will I receive my investment pay back," MPCash has launched its latest product, the Super Flash Box, which is a variant of the ordinary Flash Box and remunerated at a fixed period of two months with an interest rate of 10%. For the Super Flash Box is the same product (said ordinary Flash Box) that you buy through a subscription process. How to purchase a product of the tontine? To purchase a Flash Box or Flash Pack, you must first log into your back office from where you have access to the various tools of the purchasing process. Once inside your back office, scroll down to the product of your choice, enter the number of shareholdings you want to buy (maximum of 5 at a time) in the window "Number of Flash Box / Flash Pack" and confirm by pressing the button "enter on your keyboard" or clicking "Buy". Once you confirm, the payment page opens, and shows the available means of payment. On top of this page are displayed the details of your operation (number of products and the cost in Euro and CFA Franc). Select your mean of payment and follow the instructions. 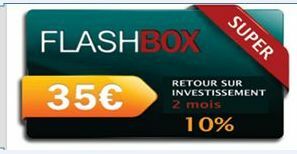 After successful subscription, click "Exit" and proceed as described previously for the purchase of ordinary Flash Box to buy your unite shares of Super Flash Box. You may return to regular Flash Box at any time, by clicking on "I cancel my subscription" and performing the reverse process of the subscription as below. How are things going after purchasing my unit shares? We had already announced right from the first page, that the system was working on the principle of flow (inflow - outflow). Therefore, once you confirm the purchase of a Flash Box or a Flash Pack, for example, you will rank on top position in the window "10 last purchases of Flash Box or Flash Pack". At the same time, the member who has received the payment from your purchase, will appears on top of the window "50 last payments for Flash Box or Flash Pack"
The time that elapses between the two positions is not precisely determined, but from our experience, it is shorter than in conventional tontine. It can even be very short, depending on the number of products and the frequencies of purchases in each category (Flash Box Flash Pack 1 Flash Pack 2, etc.). This simply means that the more people buy, the faster your turn to receive money arrives. The order is strictly observed and it is your responsibility to track and properly manage your account by following the instructions from your back office to maintain your position. Good management ensures even a shorter period to receive your payback. It is well known that, in business, it is management that always makes the difference between people, and, MPCash in that way is a business with huge potential. It is your personal business online, that no one apart of you would be able to care for better. And, to further convince yourself, nothing is worth your own experience; Sign up immediately, it's free, and mostly, buy your first Flash Box! How do I enter in possession of my earnings? If the payment reminder is already displayed and shown in the red strip on top of your back office, click on the green button "pay now" (flashing) in the middle of the red strip. Select the source of your earnings worth enough to cover the cost as displayed on the page, and click ‘‘Pay with my MPCash Balance’’ (green tab). 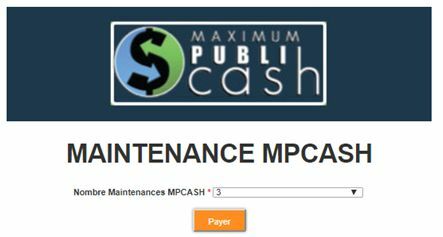 Press the button "enter "on your keyboard or click on "buy "
The payment page will open and positioned by default on " MPCash Balance " and, presents details of the payment you want to do: transaction costs, total liabilities, state of your balances Flash Pack and Flash Pack Box. then simply open the tab "source of your earnings" and select the one that has a sufficient balance for the transaction and confirm by clicking the green button "Pay with my MPCash Balance"
3. You can transfer the money in your back office to another member, a new member for example; it may be your wife, your husband, your child, or a friend. This will cost less in fees and time for withdrawal of money from your account to pay for his purchase. In turn, might he need to make a transfer from his bank account or credit card for the payment of his unit shares, you can collect that money from him in compensation and both, you save time and fees. In the menu of your back office, go to "Money Transfer" and click "Make a transfer"
Enter the recipient's nickname as above and click "Search"
4. You may withdraw your money. You receive an email and a text message from the bank notifying the arrival of the money on your account. For withdrawing your earnings, order your personalized VISA MPCash Card, if you do not have it yet. Go to your back office, click on "prepaid card" at the bottom of the vertical menu on the green strip and complete the form.